Eighteen people have been treated, including six who were taken to hospital, after part of a ceiling fell down at a holiday camp in Somerset. 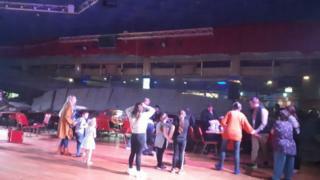 The collapse happened at Pontins Brean Sands, near Weston-super-Mare, at about 18:20 GMT, the fire service said. It said structural ducting and ceiling sections collapsed in a bar area "exposing live damaged electrics". A "number of people" suffered minor injuries but no-one was seriously hurt, Avon and Somerset Police said. South Western Ambulance Service said 18 people had been treated. Police said that a search of the scene had been carried out and confirmed that no-one was trapped under the debris. The Health and Safety Executive has been informed of the incident. Laura Robinson, whose family of five children are at the site, said about 100 people were inside the building at the time of the collapse. She said: "We were in the family clubhouse, suddenly part of the roof [came] down halfway across the room, all across tables and people. One woman told the BBC: "If I wouldn't have moved a big slab of concrete would have landed on my head and split my head open. Former New Zealand cricketer Iain O'Brien said on Twitter: "Arrived back to Pontins Brean Sands this afternoon, after a day out, to a major site panic. "Word is, and hopefully it's accurate, no-one seriously hurt. "Serious amount of emergency services here. Staff very shaken and look like they could do with a hug or two. Another man told the BBC: "My wife just ran out of the way of it. "The seat where it went down on was the seat I was going to be because my coat was on the chair, so I had to pull my coat out."